We move to the continent of Europe and onto the United Kingdom. 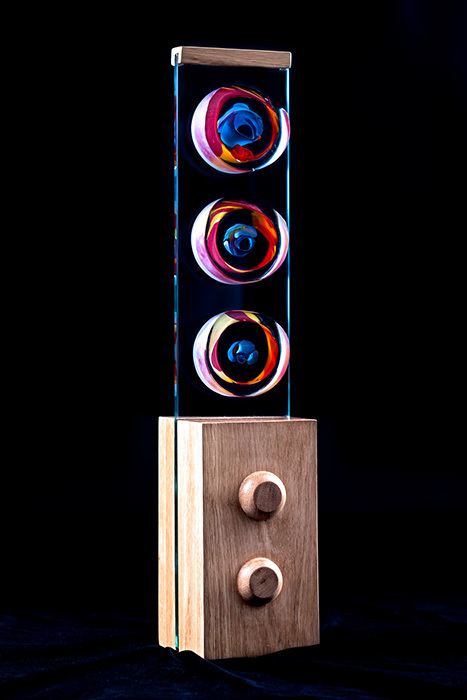 To the studio’s of contemporary craftsman and glass artist David Flower. Glass is made by melting a mixture of sand and an alkali. The first glass vessels were made in the Near East in about 1600 BC. The brightly coloured glass was opaque and was used to make small bottles, jars and jugs by coating a clay core with molten glass, then adding trails of colour. This glass was regarded as an artificial precious stone which only the rich could afford. As a decorative and functional medium, glass was extensively developed in Egypt and Assyria, brought to the fore by the Romans (who spread glass blowing, invented by the Phoenicians), and includes amongt its greatest triumphs European cathedral stained glass windows. Great ateliers like Tiffany, Lalique, Daum, Gallé, the Corning schools in upper New York state, and Steuben Glass Works took glass art to the highest levels. 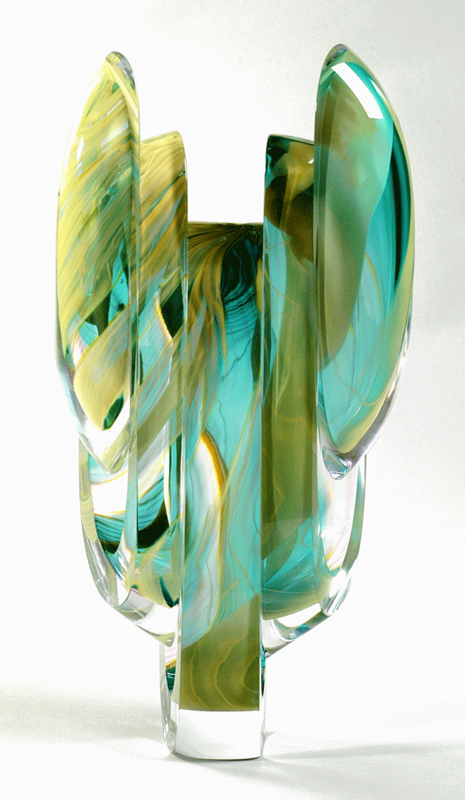 Glass from Murano (also known as Venetian glass) is the result of hundreds of years of refinement and invention. 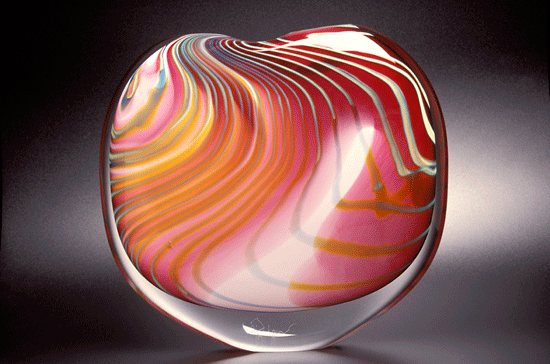 Murano is still held as the birthplace of modern glass art. 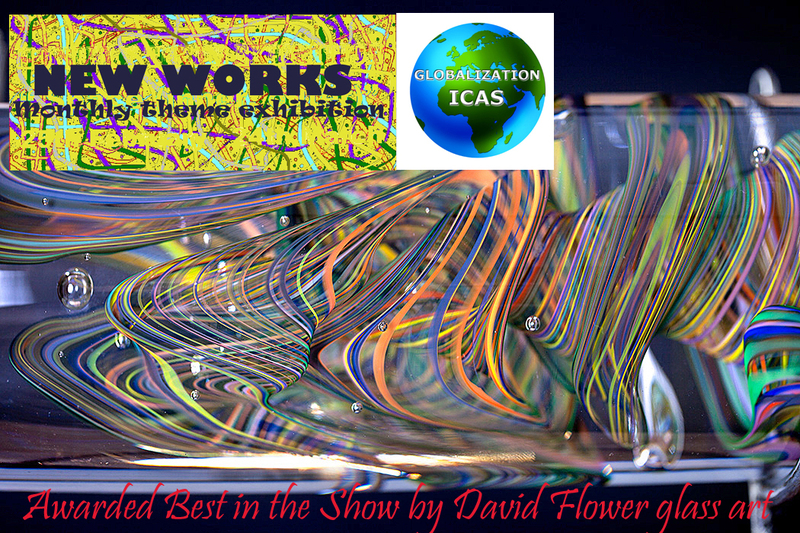 I am proud to Welcome our next guest known to us as the award-winning artist for our theme “NEW WORKS” in August – David Flower contemporary glass artist. I am pleased David that you could join us in our VIP CREATIVE LOUNGE for an exclusive interview. Q1. Sunil – What’s the first artwork you completed that you can remember? David – The first piece of work that I remember making that actually had something to say was a piece of ceramics when I was aged 13. I don’t remember the thinking behind the concept very well, teenage angst seems to be the most likely culprit, but I can describe the piece of work: I sculpted my hand and forearm in clay, in the palm of my hand was my ideal house – complete in every detail. The hand rose up from a beach scene and hundreds of steps are carved into the wrist and forearm, however the steps do not actually make it to the outstretched palm. Down at the base of the forearm a train is disappearing into a tunnel in the forearm, coming from the ocean side and reappears on the beach side as an ocean liner scattering the beach goers. The other kids in the class were making pots and bowls with pretty pictures glazed into them whilst I sculpted an idyllic scene turned to carnage. My teachers thought I was odd, I remember thinking that my classmates were odd – we could make anything we wanted and they all made a pot or a bowl! Sunil – David thank you for sharing the early story of your career in Art. We all reach this turning point and make the right choice in pursuit of our passion to seek a future in Art that is to follow our creative talent. Q2. Sunil – When did you first realize you were an artist? David – That is a tough question. 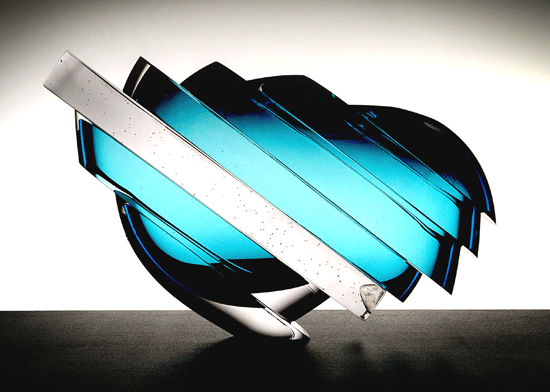 For a long time after graduating from a Design:Glass BA(Hons) degree I struggled to give myself the title ‘artist’. I would look at the artists from history that I had studied and found it impossible to put myself into the same category. Even now if someone asks me what I do I am more likely to say ‘glass maker’, my friends and clients refer to me as an artist. I suppose that I realised that I was an artist when that was the title I was given by means of an introduction but it is still an uncomfortable moniker. So many people refer to themselves as artists these days that the word is almost redundant as an effective description of what one does, so I still refer to myself as a glass maker because it is the word ‘maker’ that is so important to me. Sunil – Interesting observation – all painters, sculptors, potters, craftsmen’s, glass makers are artists. It’s how we develop our skills to be recognised for our creativity and art. You are a British contemporary glass artist and craftsman setting standards for other artists to be inspired and emulate. Q3. Sunil – How would you describe your art to someone who has never seen your work? David – I wouldn’t. I communicate via a 3D visual language, that is where my strength lies, using colour and form, texture and shape to represent thought and feeling. If I were talented with words like Thomas Hardy or Philip Larkin I am sure that words would be an excellent tool to describing my work, but I am not skilled in that way so when I describe my work it is quite clumsy: for the purposes of this interview I would say that I make abstract sculpture. Visual arts have to be seen to be understood, and after the seeing comes the subjective part, the validation of what we see, the sense making. In this day and age if someone had not seen my work I would probably show them images of my phone rather than attempt a verbal description. Sunil – I believe the magical mix here is the passion and determination you have in your work which speaks louder. With each work we finish it becomes a process of learning and understanding ourselves better as we strive to improve, always believing our best is yet to come. 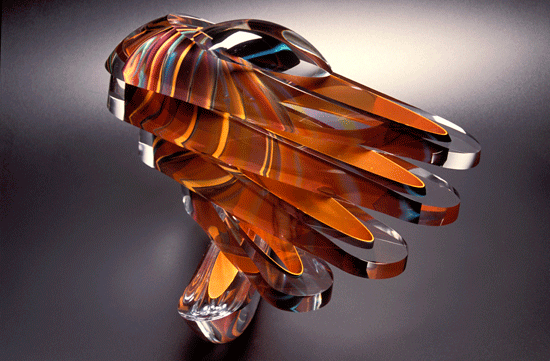 Glass art and sculpture are visually attractive, tactile and also therapeutic. Q4. Sunil – If you had the opportunity to change something in the art industry what would it be? David – I would change the way that glass and the artists that use it are viewed by the art industry. Currently glass occupies a strange netherworld, in that there are 3D artists that use glass as elements of sculpture but glass sculptures and their makers do not seem to be accepted as fine art. I am still not sure why, it could be because one has to be a true craftsman to manipulate glass that it holds the label craft very strongly perhaps. People have been creating with glass for thousands of years but as a material for true self-expression it is not well thought of. I find this odd. Sunil – David thank you for your explanation but more to the point is that other forms of Art have been around for centuries perfected by old master artists and today we are able enjoy and appreciate as Fine art . With Glass art it is quite a recent phenomenon and with the development of studio glass that has made the process possible to be used by more glass makers and artists who will recognise it as fine Art in a short period. What we are witnessing in your work is the unlimited possibilities that glass art offers and hope with our interview today we have gone some way to initiate an awareness program around the globe. Q5. 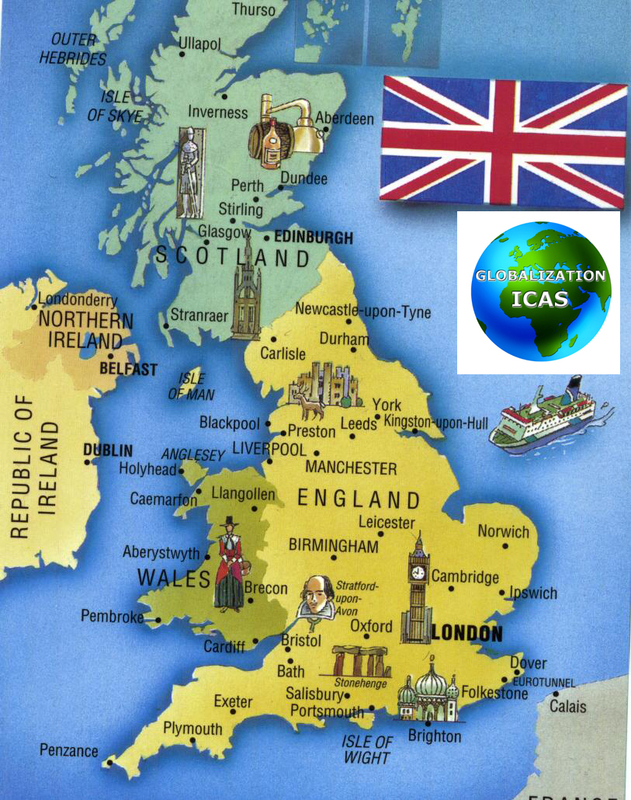 Sunil – I know you recently become active member of Globalization ICAS and aware what we have achieved as an Organisation Globally. How do you believe we could help as GICAS? David – GICAS can help by promoting the use of glass as a fine art material and the people. That use it thus as fine artists. You have the ability to connect to collectors of art, to promote the wonderful variety that is to be discovered. The UK domestic art market does not place glass artists very highly, this is merely about perception and promotion and it is here that you can help. 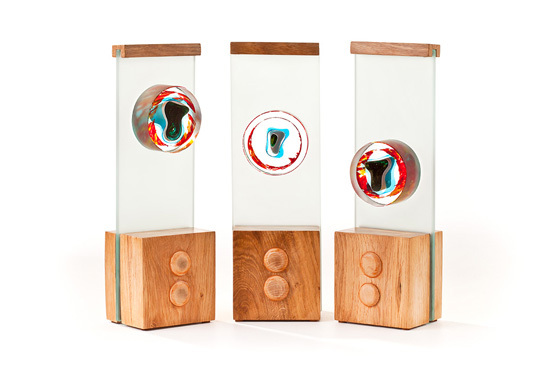 There is a new breed of collector out there, people who are excited by new materials and fresh visual languages in fine art, you can forge connections and begin to put glass art within the reach of collectors outside the very specific ‘glass collector’ bracket. For two thousand years we have been using hot glass to make objects of desire, no material has the history, or the lineage of glass. No material is as flexible, delicate, as commonly used or as routinely unseen. Imagine a life without it. Sunil – I had my own strong reasons to press you further in participating in our exclusive interview which has address your concerns not only for Glass art but other forms. Q6. Sunil – It has been fascinating following your progress in contemporary Glass Art.., Would you like to share examples of some of your major projects you have completed? 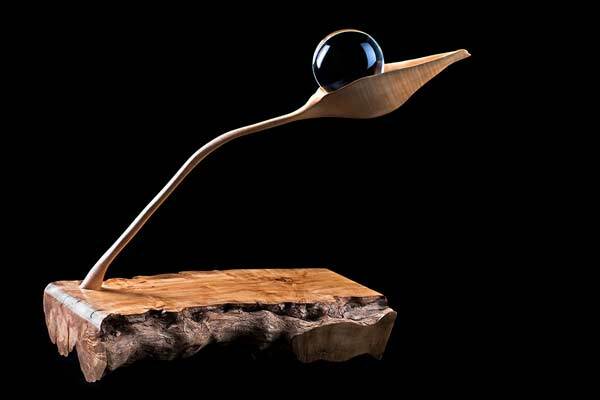 David – I work by commission to make sculpture for interior spaces, usually people’s homes. A piece that I am particularly proud of is called ‘Journey’ and it describes the life of the client from birth to present day. I love-making sculpture for someone specific, I talk to my client about their life and try to weave this information into the piece of work so that the final piece is as much about them as it is about my need to create. In this way a piece of work is a three-way conversation between client, artist and material; ‘Journey’ represents this symbiotic approach, I won’t tell you what it has to say, that is between the client and me. Similarly with ‘Impressions of Wyndham Hodgkins’ I loved the challenge of describing a client, representing him in glass, steel and wood. Wyndham, his wife Gillian and I are the only people who understand the sculpture fully, we share this secret and this experience, and that is such a privilege. Clear Space was created for a client that worked inside an office in his house, when all he wanted to do was be out in his garden, so I created a ‘projector’ for him. This piece was made to sit on the windowsill of his south-facing office and use the sun to cast its green patterns onto the walls, the clear crystal block would interject with beams of multiple coloured light, the light and colour of his garden came into his office. Everything I make is a personal response to another person, either in representing them or an aspect of their character or in attempting to improve an environment using glass and light. Sunil – David thank you for giving us an inside in the process of making your glass art more unique as the work you undertake in your commission becomes an interaction of ideas involving the journey of two parties which is finally completed when presenting your glass art to the client. Q7. Sunil – Describe yourself in 3 words; one has to be a colour? This colour is a warm and positive colour associated with our most physical needs and our will to survive. The crow is a spiritual animal associated with life mysteries and magic. Tao: The Tao, or the Yin Yang is an ultimately excellent symbol for “Twins” as it depicts the symbiotic nature of twins: The necessity to be together, yet with separate identity. Q8. 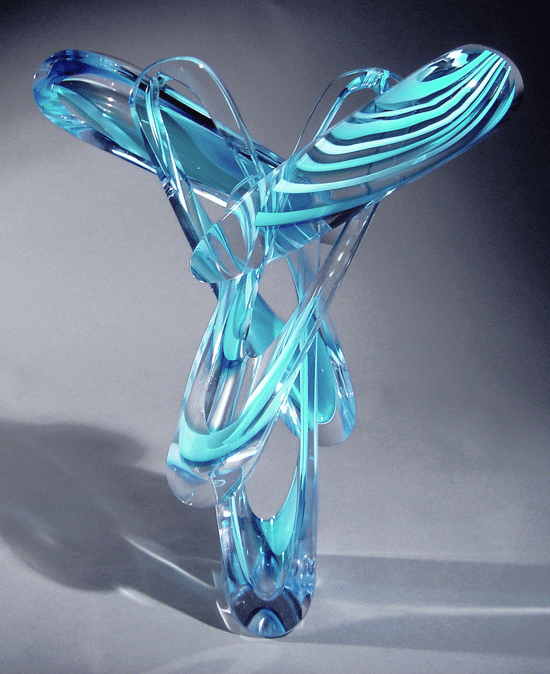 Sunil – Tell us your perfect scenario for working in glass art? David – In my perfect scenario I am working with clients that trust me, that are open to my way of working, ie extracting some part of them to go into the work. I am very fortunate in that this has always been the case for me. It is this part of the process, this desire to include the client in some way in their commissioned piece, that ensures I remain creative and challenged because I am dealing with a complex individual who will require an intuitive and informed emotional response from me when creating their artwork. People are endlessly fascinating, especially in the minutiae of our lives. Sunil – It is always fascinating how artists look to their work to be enjoyed and appreciated by others, more emphasis on how their would react? But our lesson here is How we the artists enjoy working to present our best. Q9. Sunil – Do you have any advice for artists just starting out? David – Only do it because you love it and truly loving it involves hating it, just a little. Sunil – Nicely put and very well summarised but I am sure lot of artists viewing examples of your works today will be inspired by your collection of contemporary Glass art and in future will take up glass art as one of the accomplishment to add to their development progressing further to become a Fine Artists. Q10. Sunil – Its look like we coming to the end of our amazing journey of following your development and having an inside to modern contemporary glass artists therefore leaves me ask our finally question, What are you working on just now? David – You catch me working on two projects with a third in the pipeline. Unfortunately the first two cannot be spoken about, one is bound by a non disclosure agreement and the other is a very private commission from a shy client. Mystery is always so much more tantalising don’t you think? The third is a rare personal piece involving ten thousand glass balls, each one blown by a member of the public, all suspended from the roof of a cathedral, individually lit and interacting with the sounds of the cathedral via a computer programme. A visual recording of the remarkable audible life of these buildings. Sunil – Thank you for sharing with us projects that have kept you busy through the year. Perhaps we could do a follow up discussion and get an update to your Cathedral roof project involving 10,000 well wishes, adding to the list as one of your finest achievement. Sunil – We have enjoyed this opportunity to explore your life story and understand your own personal experiences and see that all Art is never-ending. Also had the opportunity to see how Glass art has progressed through the period. David it was a great pleasure to have you in our VIP Lounge for an exclusive interview. We wish you continued success in your career. 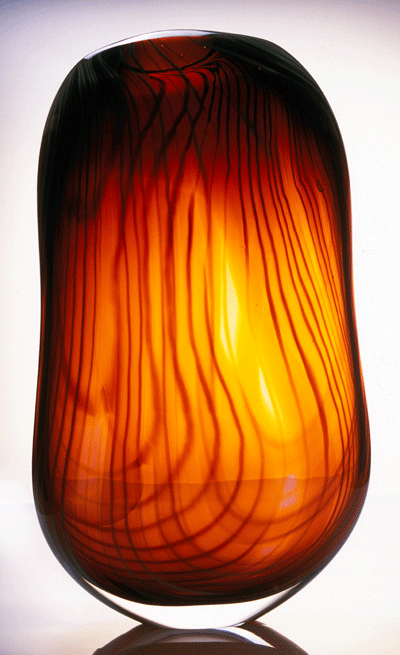 David Flower has been a leading light in UK glass-making for 10 years. 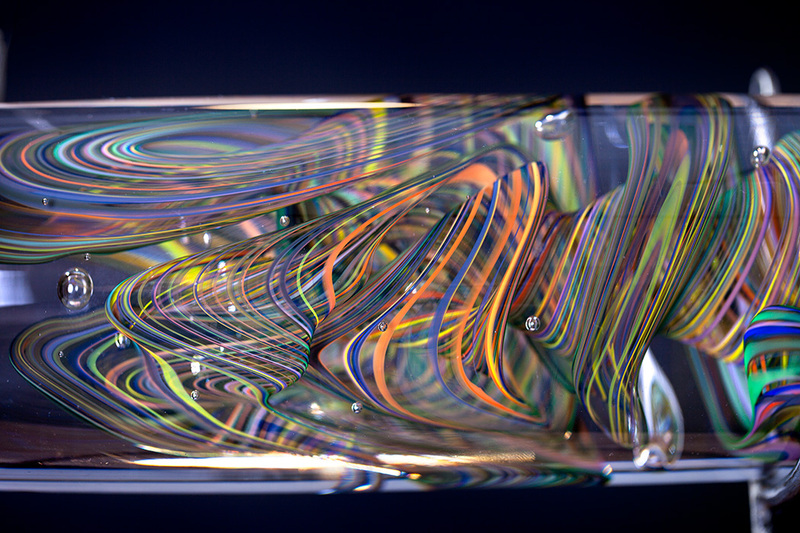 He has worked exclusively by commission to the worldwide glass collecting fraternity and has pieces in collections as far afield as Saudi Arabia, Denmark and the United States. “I love the play of color in the glass and the light that is allowed to pass through. The simpleness of the external casing doesn’t seem to offer the piece much, it seems to leave it there rather than bring it out. It is possible that in person the sculpture is much more interesting and that it is just not easy to photograph”. “You are very skilled in blown glass, turned wood and forged steel! But more than that I really love the seasons and could easily tell which season was which before I read your description. Thank you for your excellent presentation. I appreciate the close up views of individual pieces. These are delightful, playful sculptures and you have succeeded in manifesting your intention within each sculpture! I look forward to seeing more of your art works”! This kind of work rarely comes out; particularly bold experiment of materials used; it stands as different presentation; but the original must be more strong in impact then in photographed as commented. Seasons are always free and not bound; any time in the life they refresh us with velocity of vibrancy and surrounds us with their individuality. Here the artist has used the spinning of seasons in some kind of rotating media; but the original must be more novel and the efforts open up the new possibility of more such experiments. “There is an impeccable quality here that is beyond the technical execution. The conceptual foundation that speaks to science as well as art finding its expression architecturally as sculpture is not just innovative and original but speaks also to a deep intelligence and intellectuality acuity that is something of an extinct species in contemporary art these days. There is rare dimensional thought at work here. Frankly speaking I could write an essay on this work. My compliments David. Simply excellent”. This beautiful representation of this most talented artist’s work reveals the intense study and mastery of the material and the beautiful creative expressions of the artist. These works are a credit in the evolution of glass art and give significance to the permanence of glass as a medium in the world of sculpture. Thank you very much for your generous comments, it gives me great heart to hear people feel that glass art has a permanent place in the world of sculpture. Excellent use of materials,wood , glass, steel. 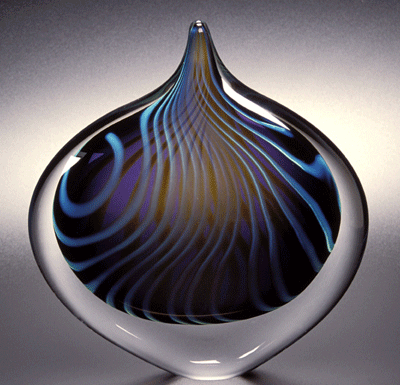 David Flower is evidently very skilled in blown glass, turned wood and forging. However his artistic skills lie much deeper than this, he has imagination, originality, exceptional eye to detail. The rustic bases when used contrast well against the cold glass and steel and I love the fluidity and movement of the interior structures. The four elements (seasons)are perfectly positioned against the black back drop producing an exceptional abstract image. Excellent work, fabulous colours. I love this artists work! I was delighted to read your generous comments, you have taken time to truly absorb and critique the images, what more can an artist ask of an audience? Thank you. Thank you so much Sunil for this enlightening interview and thank you to David Flowers for sharing! 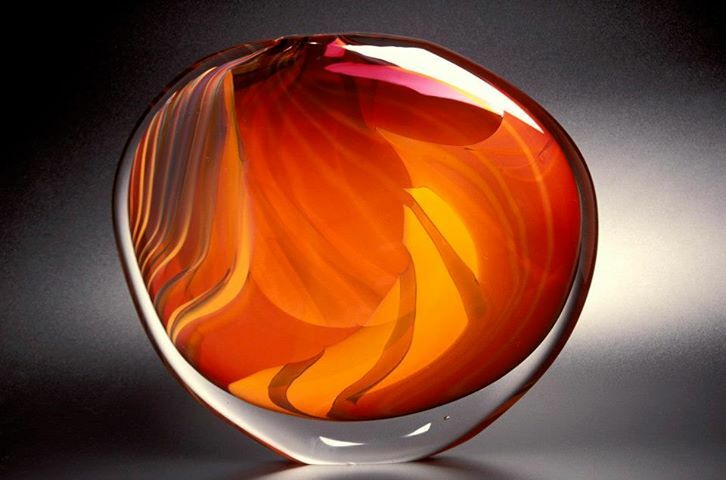 I am so fascinated by your skills and the process by which you develop your glass making. It is wonderful that you engage so fully with others in your creations. The 10,000 glass balls in the cathedral is delightful and to have sounds working with these glass balls is totally awesome. I hope I can visit and view your glass works sometime and see the 10,000 glass balls and hear them too! Very best wishes! Thank you for your lovely comments. I would be most delighted to show you around the cathedral piece when it is finished, it will be a long process – some 2 years in development! I like your technique and your glasses … I’m only a linocu – but you? 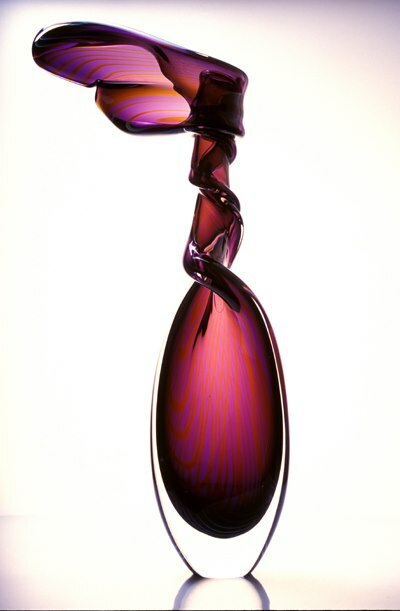 This glass work is so stunning and captivating. It makes you pause to take in the light, color and shape. Thank you. What a gift you are sharing with us.